Raw on $10 a Day (or Less! 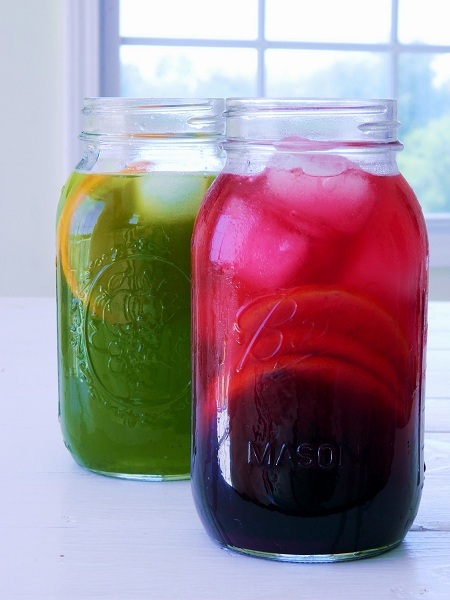 ): Beet Lemonade & Green Orangeade ~ Raw Food Recipe for Kids! Beet Lemonade & Green Orangeade ~ Raw Food Recipe for Kids! These drinks are a couple more recipes adapted from my Spring Raw eBook, available above. They're perfect for sipping on all day long to stay healthfully and deliciously hydrated, but also make the perfect pitcher of drinks for lunch guests. Kids seem to love them and they easily and tastefully replace sugary drinks or juices. Simply mix all the ingredients together in a drinks pitcher, and stir. Green orangade sounds tasty, not so sure about the beet lemonade. I'd hafta try! Maybe I'll make a brew. these recipes look great, but I am not sure how you can get a cup of kale juice for 50 cents? A bunch here costs nearly $4 and my juicer can't produce a cup of juice from it. Let me know your secret! what an awesome recipe! i love the colors too! so refreshing! Hey there, You have done an incredible job. I'll certainly digg it and personally suggest to my friends. I am sure they will be benefited from this web site. Thanks so much for providing individuals with an extremely marvellous chance to read from this website. It’s usually so nice and also jam-packed with fun for me and my office mates to visit your web site a minimum of 3 times in one week to study the fresh items you will have. And lastly, I’m so certainly pleased for the excellent opinions you serve. Certain two areas in this article are ultimately the most impressive we’ve ever had.